Probe installation is accomplished by using the Probe Installation Tool (PT) to seat even the sharpest tip styles without damaging the tips. The following method should be used when installing all probes. The information in this section is meant to explain the variables, define the tests, and most importantly, to provide engineers and designers with needed probe accuracy specifications. 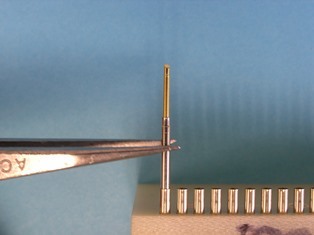 Probes can be installed by hand or using tweezers. When placing the probe into the mounting hole with tweezers, grab the probe tube avoiding the mouth area. 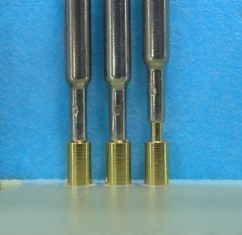 Using QA’s PT tool, push on the probe tip to guide it into the socket or onto the termination pin. Continue pushing until a positive click is felt. When using X Probe, proper installation is key. 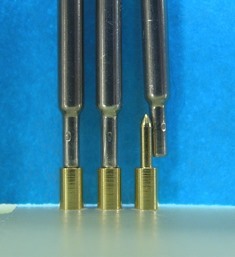 The X Probe may have missed the termination pin and is not making the connection. Remove the X Probe and re-install. A properly drilled spacer plate will prevent this. 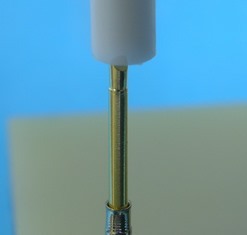 Improper connection of the X Probe onto the termination pin. If the X Probe is sitting too high, it may not be seated properly.